Professional photographers and representatives from London's homelessness sector community chose the MyLondon exhibition yesterday in preparation for the annual exhibition and calendar. The social enterprise engaged 105 people affected by homelessness in the first week of July when they picked up disposable cameras and took photos of London over five days. 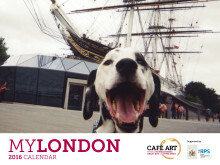 The project engages people through photography and from October they will sell the MyLondon calendar in London markets. Last year's calendar inspired other projects around the world, with MySydney and MyBudapest happening this month. Last year's calendar sold 6,000 copies in over 50 countries. The profits go into engaging people affected by homelessness though art and photography. The participants are also engaged in selling the calendar, gaining confidence and self esteem through the work experience. Caption for photo below: Paul Ryan from Cafe Art coordinated the judging process. The judges were (from left to right): Kit Shah from London Photo Festival, David Tovey, former homeless artist, Chris Cheesman from Amateur Photographer magazine, director general of The Royal Photographic Society Dr Michael Pritchard, well known photographer and former Sun photo editor Ken Lennox, Christies, Olivia Wallace from Christie's and Jeannie Corby from FujiFilm. The exhibition will be held in Spitalfields Arts Market from 1-7 August and the calendar will be launched online on 4 August. The actual calendar will be available from 10 October 2016, World Homelessness Day. Prior to publication, it must be approved by Cafe Art. 3 September, 2015 - A calendar of photographs taken by London people affected by homelessness in London has ​gone viral in the past week, prompting worldwide interest. The My London calendar will be launched with huge celebration in Spitalfields market, today, Monday 12 October at 1pm. 100 homeless people photographed London in July: "The results are breathtaking" (BuzzFeed). An exhibition in the market also opens today. 100 disposable cameras will be given to homeless people at St Paul's Cathedral on Friday 30 June. The MyLondon photography project runs over five days, is to empower people affected by homelessness and results in an exhibition and calendar. Run by Cafe Art and The Royal Photographic Society, it has inspired similar projects in Budapest, Sydney, New Orleans, Sao Paulo and Toronto.